We can't deny it, the holiday season is soon upon us. I'm not planning to sew a lot of Christmassy or winter themed items this year. It's just not that wintery here in Cayman! That doesn't mean I don't want to dot around a few subtle Christmas items around the place, and with all the extra entertaining and visitors that happens at this time of year, I needed some coasters for all those cups of tea. These are really quick and easy to make, and make ideal hostess gifts too. Make half a dozen and wrap them with a festive ribbon and they make a nice little ‘thank you' to hand over to the hostess if you are invited round for drinks or dinner. 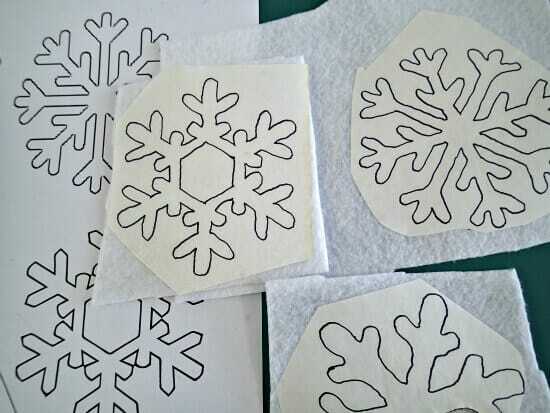 Trace your snowflake template onto your sheet of fusible web. 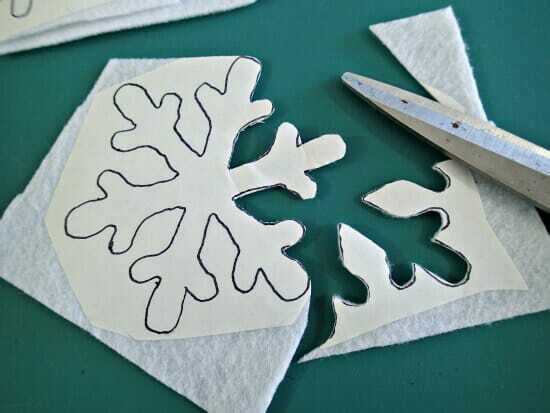 Cut roughly around the template and following manufacturer's instructions, fuse the Heat n Bond to the white felt. 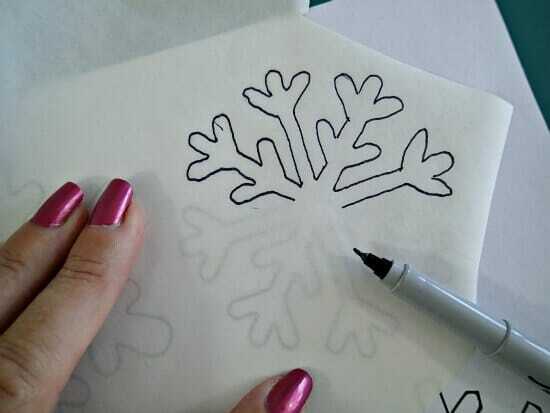 Carefully cut out your snowflake. 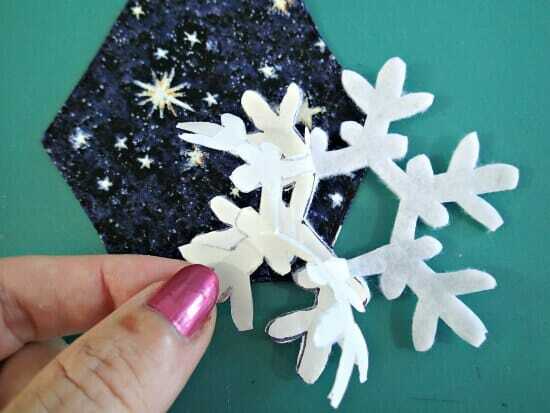 No need to worry if the paper starts to come away a little bit, so long as the glue is attached to the felt. 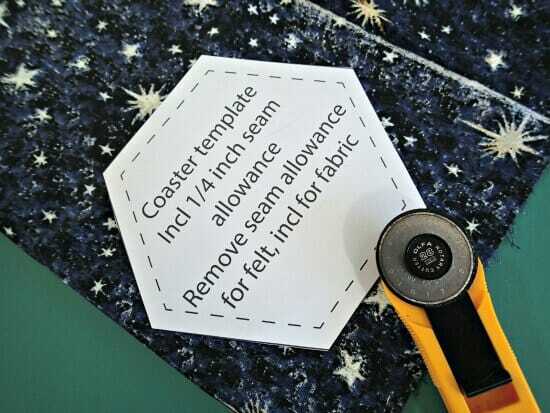 Cut out your hexagon template on the outer line for fabric or the inner line for felt. The outer line includes a seam allowance of 1/4 inch. Cut 2 in fabric or 1 in felt. For fabric – place your two fabric pieces right sides together and sew around 5 sides with a 1/4 inch seam allowance. Trim off the corners. Turn right sides out, press and press the raw edges of the opening to the inside. Top stitch around the outside with a 1/8th approx seam, closing the gap as you sew. 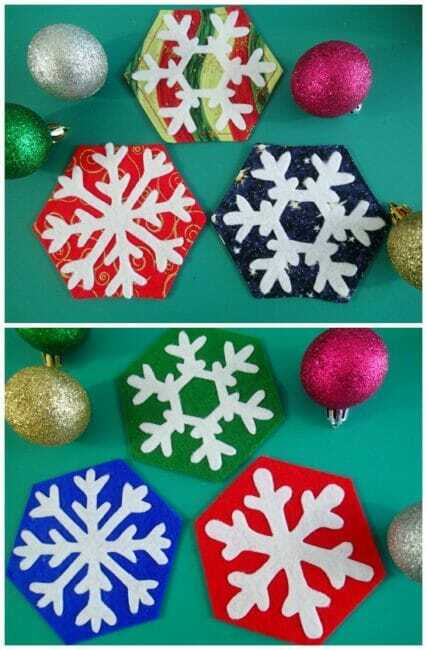 Remove the backing paper from your snowflakes and fuse them onto the fabric. Done. 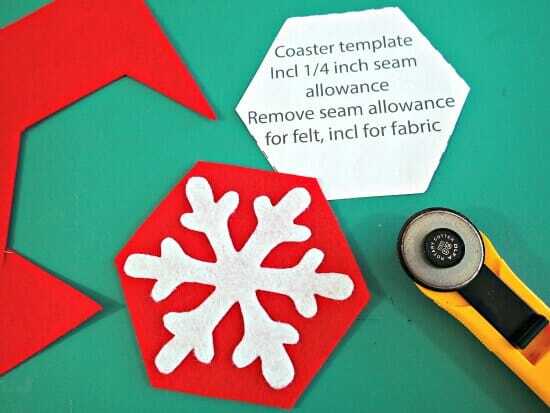 For felt – simply remove the backing paper from the snowflakes and fuse them onto the felt. Done, easy as that. You'll have a whole bunch of these made in no time! I bet this would look great as a table runner too. 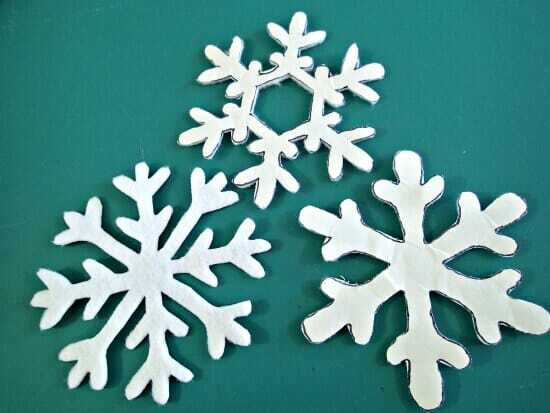 How about make a plain table runner and decorate it down the center with a flurry of snowflakes in all different shapes and sizes. 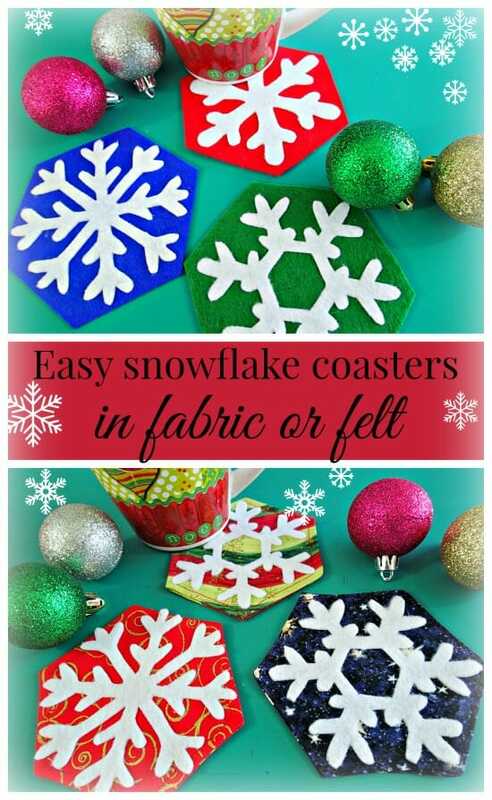 Change your scale on the printer when printing the template to make them larger or smaller for your snow drift table runner to match these coasters. 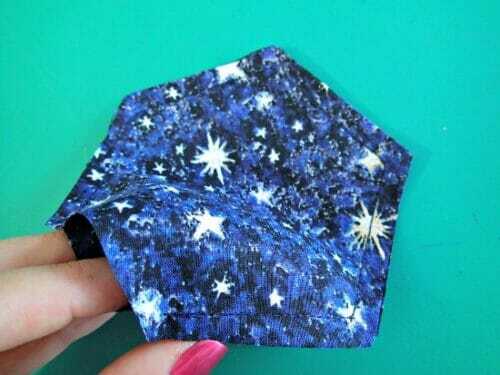 Or enlarge to make a hexagonal placemat for your Christmas table – so many possibilities. 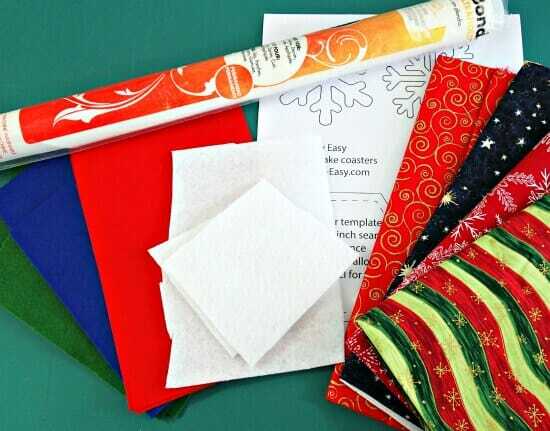 Please share what you make for Christmas in our sewing chat group on Facebook. I would love to feature this project on my Bernina DesignWorks blog with your permission of course. I would include a link back to this post. Hi Adeline, I’ve been searching around and am not sure which blog is yours. The only one I can find seems to be dormant for months, I must be looking in the wrong place. Can you send me a link please, I’d love to look at your site. Sorry I forgot to thank you. Hi Deby, great quick easy project to do with my Grands. The 3 oldest, 2 girls 1 boy. So happy to have this free tutorial for them and me. You always have fun easy things to make that look good when done. Thanks for another great idea and tutorial.